Tag line: "H.G. 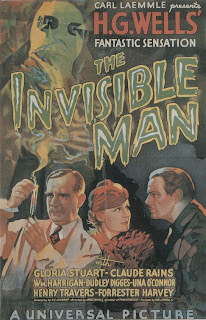 Well's Fantastic Sensation"
The original choice to play the title character in The Invisible Man was Boris Karloff, who was ultimately dropped from the project when he and Universal couldn't agree on a new contract. This cleared the way for director James Whale to hire Claude Rains for the part, and as it turned out, the pairing of the two was a match made in heaven. Dr. Jack Griffin (Claude Rains) has developed a formula, which he calls Monocaine, that has made him completely invisible. In order to work on an antidote in secrecy, Griffin, disguised in bandages and a false nose, leaves his fiance, Flora (Gloria Stuart), behind and quietly sneaks off to a small village in the English Countryside. But after a few weeks, an unexpected side effect of the monocaine kicks in, one that directly affects Griffin's brain, filling him with psychotic delusions of grandeur. Now viewing his 'condition' in an entirely different light, Griffin abandons all hope of returning to normal, and instead tracks down his old colleague, Dr. Arthur Kemp (William Harrigan), whom he plans to make his partner in an attempt to take over the world. From a technical standpoint, The Invisible Man is a skillfully shot film; with director Whale employing a number of unique camera angles and tracking shots to keep things moving. There are also a good number of truly impressive special effects, like when Griffin, in a state of frenzy, peels off his bandages to reveal the nothingness underneath them. I have to say that, with such nifty special effects, I sometimes found it hard to believe I was watching a film produced in the early 1930's. But the real spark that brings life to The Invisible Man is the performance of Claude Rains. When we first meet Griffin, he's checking into a bed and breakfast, maintaining a high degree of secrecy so as not to reveal his 'condition'. But as his mind starts to fall under the monocaine's control, his demeanor changes, and he becomes much more volatile. When the owner of the bed and breakfast (Forrester Harvey) tries to throw him out of his room, Griffin at first pleads for more time. But the pleas quickly change to insults once the owner starts packing up some of Griffin's equipment. At that point, Griffin snaps, hitting the man over the head with his leather-bound journal before tossing him down the stairs. Rains handles the transition in his character's personality brilliantly, especially when you consider that he does so without the use of his eyes or facial expressions. It was Rains first starring role, and gave the world a glimpse at the immense talent he would continue to display over his career. There are several moments of broad comedy thrown into The Invisible Man, some of which simply don't work. Chief among them is the performance of Una O'Connor as the wife of the owner of the bed and breakfast, who spends most of her screen time hamming it up, shrieking and crying incessantly. But such moments don't detract from the film as a whole, and the combined efforts of its director and star proved enough to propel The Invisible Man into the annals of horror history. Wow this is a really nice final episode. At the listener emails and it is a nice going out. I appreciate this can't wait to hear the bloopers! First comment this episode that is kool. Thanx for coming back one last time for us that is great. Doctor who is hosting this new epic horror is it Billchete? it sounds exciting. I sure wasn't expecting this, iTunes started downloading an episode and I am thinking "what, they are back, yes"
I am glad the hosts are continuing on to this Terror Troop podcast. From a fan to the Planet Macabre hosts thank you for putting a last honor to the fans. It was a pleasant shock and I loved it. @Jessup: I'm glad you enjoyed the final episode (and to be honest with you, I can't wait to hear the bloopers myself! Billchete put that clip together, and kept it a surprise!). @Balfour: The true thanks for this bonus goes to fans like yourself. As for the new EPIC HORROR show, Billchete will be there from time to time, but he will not have any time to host it. @Anonymous: I had completely forgotten about that! Now I REALLY can't wait to hear the bloopers! @L.S. : So glad you enjoyed it, and it thanks to the fans that it happened. It was definitely nice to get together with everyone one last time! @Anonymous: The true thanks goes to you and all the fans. It was certainly our pleasure, and I'm so glad you enjoyed it. Again, thanks to everyone for the kind words, and for listening to Planet Macabre. TY I appreciate the episode dedicated to us, It made me sad but I could really feel how much each host will miss it. Know that this show existed solely because of the wonderful support we've gotten for the past 1/2 year from fans like yourself. Therefore, it's WE who thank YOU. Take care, and thanks for listening! Excellent ending to the podcast. Thank you for putting that together. Which would you suggest Doctor Shock, Hollow Man with Elizabeth Shoe or this original Invisible Man? @Charlie: Glad you enjoyed the episode, and thank you for being such a loyal listener of Planet Macabre! In truth, it's been a long while since I've seen HOLLOW MAN, which I remember liking (though, honestly, not loving). Of the two, I would most definitely prefer the 1933 original. @Larz: Thanks for the kind words, and for supporting Planet Macabre. This last episode was to show just how much that support means to us all. Enjoy the movies (and please be sure to stop back and let me know what you think of them)! While I really did enjoy my recent viewing of The Invisible Man, O'Connor's incessant shrieking was pretty annoying. I'm also still rather perplexed at the immediacy of the endings for most early horror films. The ending bloopers was a hoot and you can tell by that how well each host admires each other. The thing that puzzles me to no end is; I understand that the main guy Billchete has no time to devote the continuing on Planet Macabre, but I can not for the life of me understand why all of you would do a joint venture with the Creepture guy Gregamortis. There was gobs of reasons why us fans made Planet Macabre #1, hence the emails read which I agreed whole heartedly with. The first fan email summed it all up. And each point that Planet Macabre nailed was the exact opposite of the Creepture. I wish that Planet Macabre would just take a leave of absence until more time would allow itself. By combining the two is a major mistake. The hosts at Creepture are annoying, have no chemistry, audio blows and the lead Greg is an ear-hurting mess. I do understand that the podcast wants to become "bigger" and offer more, but please remember, we are fans and want a podcast that covers horror movies, nothing more, nothing less. I hope this helps you all in your decisions and please know that Planet Macabre is an outstanding podcast and I am deeply sad that it will disappear. @Klaus: While I can't say the ending of THE INVISIBLE MAN bothered me (probably because, as you said, they ALL have that abrupt sort of ending), I am in complete agreement with you on Ms. O'Connor! She would return to the screen in Whale's BRIDE OF FRANKENSTEIN a few years later, and while shrill in that one as well, not nearly as much so as in this film! I really, REALLY wanted her to shut up! @Noah: Thanks for the kind words regarding the final episode, and the podcast in general. They are certainly appreciated. As for Epic Horror: like Billchete mentioned in the podcast, this was in the planning for some time. The original plan was to shut both Planet Macabre and the Creepture Show down sometime at the end of June, then transition both listener bases over to Epic Horror. Billchete's early departure only moved that schedule forward. I say this only to clarify that Epic horror was in existence (at the very least, in the planning stages) before the end of Planet Macabre, and was not a hastily-arranged "fall-back podcast" (for want of a better term) after Macabre ended. If everything went according to plan, Billchete would have been a regular part of Epic Horror as well, but it was not to be. So, essentially, there wasn't going to even be a Planet Macabre to put on hiatus. The plan was always to shut it down and merge the 2 podcasts. As for Gregamortis, I do consider him a good friend (as you said...and I agree with you...it's obvious in the bloopers reel that we all have a great deal of respect for one another), and I am perfectly happy to continue on with him as host on Epic Horror. As for your not caring for the hosts on the Creepture show, seeing as I was a regular host over there as well, I must shoulder some of the blame for that. All of us knew that the end of Planet Macabre was going to be a bittersweet experience, mostly because of the wonderful fans such as yourself who made doing the show a thrill. And while you may have reservations regarding Epic Horror, I do ask that you at least give it a chance. Personally, I feel it is going to be something very unique, as well as very entertaining. Thanks again for being a loyal fan of Planet Macabre. Your support, and the support of all the listeners, has been humbling, to say the least. Excellent sign - off to the best horror podcast in the world. I have a suggestion and I also emailed into Bill Chete. Why don't you and him start - up your own podcast. Both of you have the strongest voices, make the best points and the clarity of discussions are great. I will be your first subscriber and fan! What do you think? I can not see my self traveling over to a new podcast with Greg at the pulpit, it just doesn't work. Thanks for the kind words. I'm glad you enjoyed the finale! I am very flattered that you feel me strong enough to co-host a show alongside Billchete. Unfortunately, Billchete will have no free time in the coming months to make any such show a reality, and I am fully committed to being a part of Epic Horror. I do hope you will stop over and give it a listen. The first show will post on Sunday, June 19th. Thanks again for the kind words. They are truly appreciated. And thanks also for listening to Planet Macabre. That was a neat ending to an excellent podcast. I liked the fan support nods, bloopers and a last go-around of the DVD pix. Thanks for the kind words regarding the final podcast. I'm happy you enjoyed it, and thanks to you for the wonderful support you've given the show these past 6 months. It is truly appreciated. Doctor Shock of the Planet Macabre Podcast. @TheSharkRig: Thanks for stopping by, and for the comment. I'm sure there's a good many people who felt the same way you did (many of whom still do). Not that I was trying to be off-putting, mind you, but when you have as many listeners as Planet Macabre had, you have to assume there are a good number out there who won't agree with you, others still that simply won't like you! When you make a decision to put your opinions out there for everyone to hear, it's something you just have to learn to live with. That said, I'm pleased I was able to "reach" you (even if it DID take until the very last show to do so). I appreciate your going back and listening to the shows again. Hopefully, I'll come off less "snarky" (trust me, if I sounded that way, it was completely unintentional). But don't be surprised if, after another listen, you still don't agree with me...I promise I won't be offended! Thanks so much for being a loyal listener of Planet Macabre. The support of fans like yourself was truly appreciated, and made the show a joy to record over the past six months. And it's to you, and the many others like yourself, that episode #15 is dedicated. i LiKeY this movie dOc GooD way To gO ouT on the PoDcAsT! Thanks so much for the compliment, and I'm glad you enjoyed the last episode!